The walls of this huge pit display classic white Upper Chalk with prominent flint bands. The unconformity between the Chalk and the overlying Pleistocene sediments is irregular and the result of solution. Where solution has been most extreme these sediments 'pipe' down into the underlying Chalk. The quarry was initiated early in the 19th century and was rapidly enlarged for cement production from the 1950s to the 1980s, when it closed. 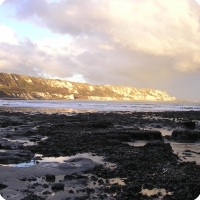 An important fossil collection from the Chalk (Douglas Watson Collection) is housed in Dartford Museum. Also mammalian fossils (Mammoth, Rhinoceros, Bison etc.) collected from the Coombe deposits (removed by quarrying), are housed in the Natural History and Dartford Museums. The site was developed as a retail centre in the late 1990s, took 4 to 5 years to complete, and opened around 2000. 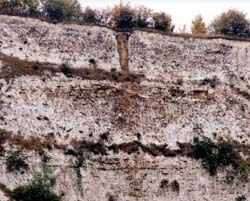 The quarry walls show classic Chalk facies with lines of flint overlain unconformably by Pleistocene deposits. The latter form an irregular to piped surface that is an excellent example of an unconformity. Although it is not possible to examine the rocks 'hands-on' the views of the quarry faces from the car parks and walkways are extremely informative and excellent for the general public to appreciate. Water in the lakes that surround the centre is derived from a natural aquifer in the Chalk. The solution pipes and other geomorphological features in the Pleistocene unconformable surface are worthy of research study using binoculars. Ease of access makes this an ideal educational site. The 'Timberland Discovery Trail' that already exists could form the basis for a similar geology trail in this unique setting. Excellent access and safety standards for shoppers, adults and children enjoying the nature trail and other outdoor pursuits. There are large, well organised car parks at three levels. RIGS are geological sites that are important for historical, scientific research or educational reasons. SSSIs give legal protection to the best sites for wildlife and geology in England.